In an article in The Journal of Human Evolution, a team lead by Professor Tracy Kivell of Kent's School of Anthropology and Conservation concludes that although stone tool making has always been considered a key influence on the evolution of the human hand, accessing bone marrow generally has not. 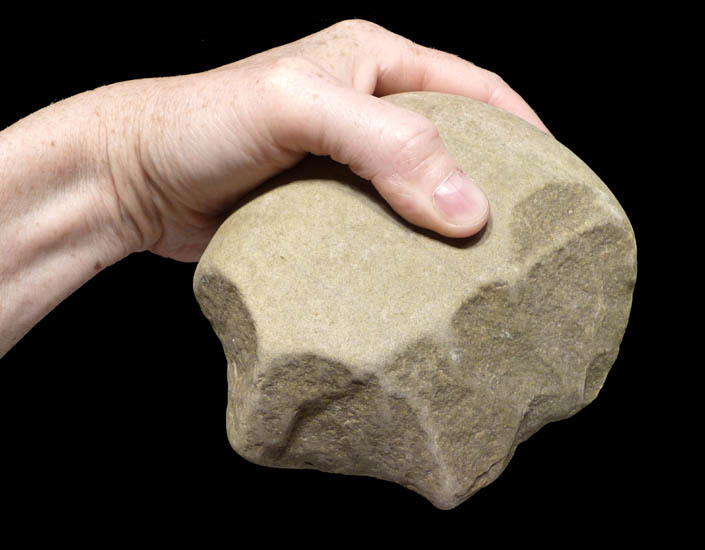 It is widely accepted that the unique dexterity of the human hand evolved, at least in part, in response to stone tool use during our evolutionary history. Archaeological evidence suggests that early hominins participated in a variety of tool-related activities, such as nut-cracking, cutting flesh, smashing bone to access marrow, as well as making stone tools. However, it is unlikely that all these behaviours equally influenced modern human hand anatomy. To understand the impact these different actions may have had on the evolution of human hands, researchers measured the force experienced by the hand of 39 individuals during different stone tool behaviours - nut-cracking, marrow acquisition with a hammerstone, flake production with a hammerstone, and handaxe and stone tool (i.e. a flake) - to see which digits were most important for manipulating the tool. They found that the pressures varied across the different behaviours, with nut-cracking generally requiring the lowest pressure while making the flake and accessing marrow required the greatest pressures. Across all of the different behaviours, the thumb, index finger and middle finger were always most important. Professor Kivell says this suggests that nut-cracking force may not be high enough to elicit changes in the formation of the human hand, which may be why other primates are adept nut-crackers without having a human-like hand. In contrast, making stone flakes and accessing marrow may have been key influences on our hand anatomy due to the high stress they cause on our hands. The researchers concluded that eating marrow, given its additional benefit of high calorific value, may have also played a key role in evolution of human dexterity. Interesting study, but it's a logical fallacy to say that because human hands can crack bones, our ancestors ate bone marrow. Mammals use stones to open nuts (e.g. chimp, capuchin) or shellfish (e.g. capuchin, sea-otter, marsh mungo). Human hands have resemblances to those of African clawless otters. Archaic Homo fossils & tools are typically found next to edible shellfish (e.g. Munro 2010). Of all foods, shellfish are richest in brain-specific nutrients (e.g. Cunnane 2005). Why didn't the authors consider removing & opening of shells? Early-Pleistocene Homo did not disperse intercontinentally (e.g. China >2 Ma) running over open plains: this is physiologically (e.g. sweat=water+salt), nutritionally & otherwise impossible. Biological comparisons show that they simply followed the coasts & rivers, feeding on waterside & shallow-water foods (google e.g. "Ape and Human Evolution 2018 bioloby vs anthropocentrism"). Human hands are unique among primates in that not only thumb & 4 fingers can move +-independentaly (opposable thumb), but thumb, index & 3 fingers: this evolved more likely for manipulation of shells (e.g. for holding a shell in the palm of your hand & at the same time removing another shell) than for fabrication or manipulation of stone tools. That "bone marrow played a key role in the evolution of the human hand" is a just-so interpretation: it's not because we can crack bones with stones that we must have used them to do so, let alone that we must eaten bone marrow. Comparative data show that stone tool using animals (chimps & other apes, capuchin monkeys, some otters & mangooses) use them to open hard-shelled foods: nuts and/or shell/crayfish. In fact, bone marrow is much too poor & rare to have been able to be used for building our large brains. Brain-specific foods are typically seen in littoral foods, and it is exactly when archaic Homo during the Ice Ages spread over different continents, that their brains enlarged dramatically: apparently, early-Pleistocene Homo followed the African & southern Eurasian coasts & rivers when dispersing intercontinentally. During the Glacials, sea-levels dropped, and vast territories on the continental shelves, probably tree-poor & shellfish-rich, became available for handy & tool-using hominoids. Seafood = brainfood: richest in DHA, iodine, taurine & other brain-specific nutrients. Google e.g. "Coastal Dispersal of Pleistocene Homo 2018 biology vs anthropology".